How do you kick off Wrestlemania weekend? 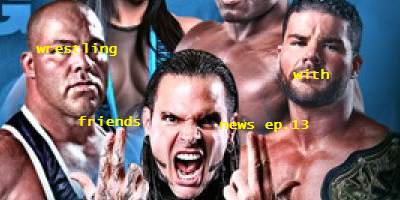 Why, by listening to the latest News droppings from Wrestling With Friends, of course! The pot is bubbling over with interesting news bits from all over the wrestling world, not just the WWE. But the Friends find a way to navigate through just in time for the choppy waters of the Friends Cup! With 9 matches on the card, plus bonus points, you can believe things are about to get shaken up! Talking Points: Stealing Baby Signs, Re-Upping with the Beast, Title Tugs-o-war, Wrestling Isn't Wrestling isn't discussed, Sting's (TNA) DVD, Global Takeover Begins in Sin City, Life and Death of Perro Aguayo, Jr. Final Song - Anti-Flag, "Die For Your Government"